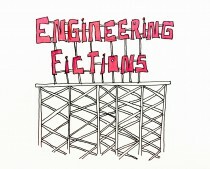 CONNECT’s artist in residence, Dennis McNulty, and CONNECT researcher, artist and writer Jessica Foley will lead Engineering Fictions, a hands-on science fiction infused experimental writing session, at the Liverpool Biennial on 14 September 2016. This session of Engineering Fictions takes place in the context of Dennis McNulty’s exhibition, Homo Gestalt: The Time Domain, at Bluecoat as part of Liverpool Biennial 2016. The seed for this session begins with a science-fictional concept called ‘BLESH‘.